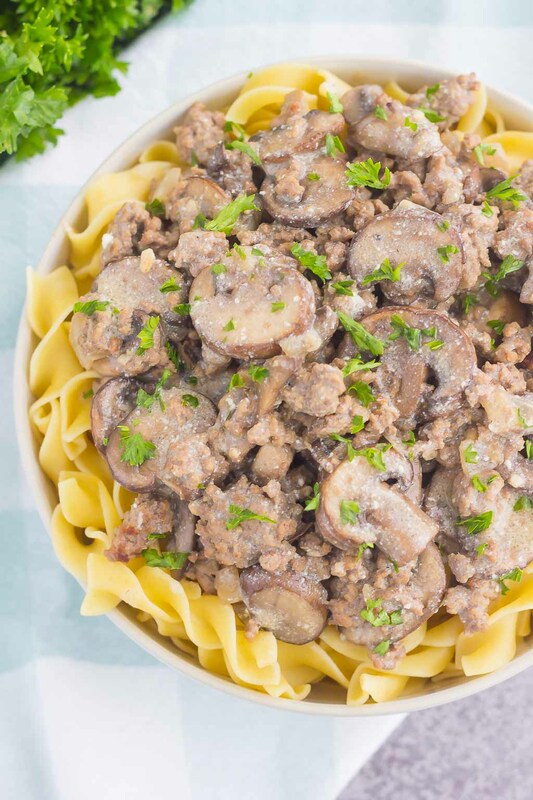 This One Pan Beef Stroganoff is packed with crumbled ground beef, tender mushrooms, and a rich and creamy sauce. 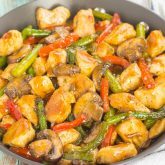 Made with just a few ingredients and ready in just 30 minutes, you can have this easy dish ready to devour in no time! I am so excited about this 30 minute meal, friends! This is one of my favorite comfort dishes that takes me right back to my childhood. Don’t you just love those kinds of foods? Chicken noodle soup and grilled cheese also take me right back there, but today, I’ve got a warm and hearty, stick-to-your-ribs kind of dish to share. Beef stroganoff! 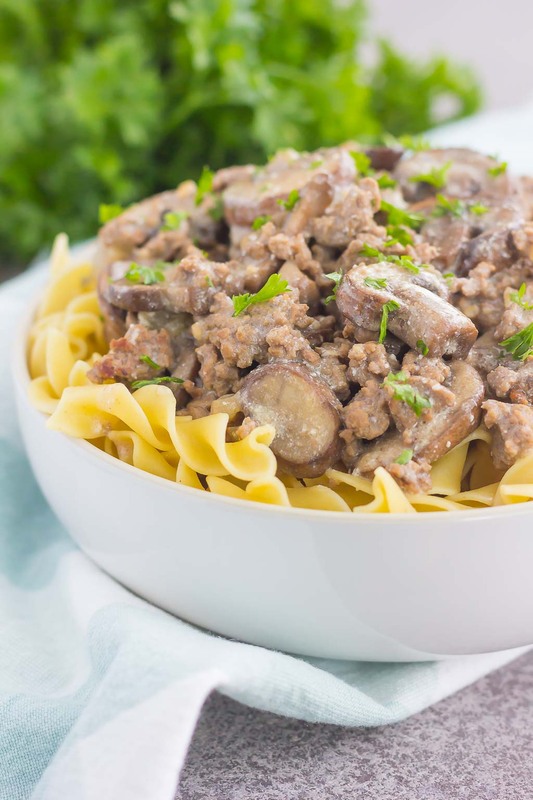 But not just any beef stroganoff, a One Pan Beef Stroganoff, made from scratch, with no canned soup, and ready in just 30 minutes. How does that sound for a Thursday? If you grew up with this dish, chances are you loved the combination of beef and mushrooms, with that rich and creamy sauce. The funny thing is that I can’t remember my parents ever making this dish (I know, right?!) but I can remember eat it at potlucks and other people’s houses…go figure! In any case, it has always been a great love of mine, and a dish that I haven’t eaten as much as I would like. So, when I was brainstorming ideas a few months ago for some new 30 minute meals, beef stroganoff immediately popped into my head as a delicious winter meal. And trust me when I say that this is comfort food at its finest. Ground beef, tender mushrooms (you all know my mushroom obsession! ), a simple sauce make this dish extra special. And when you serve it over hot egg noodles, get ready to be wowed. 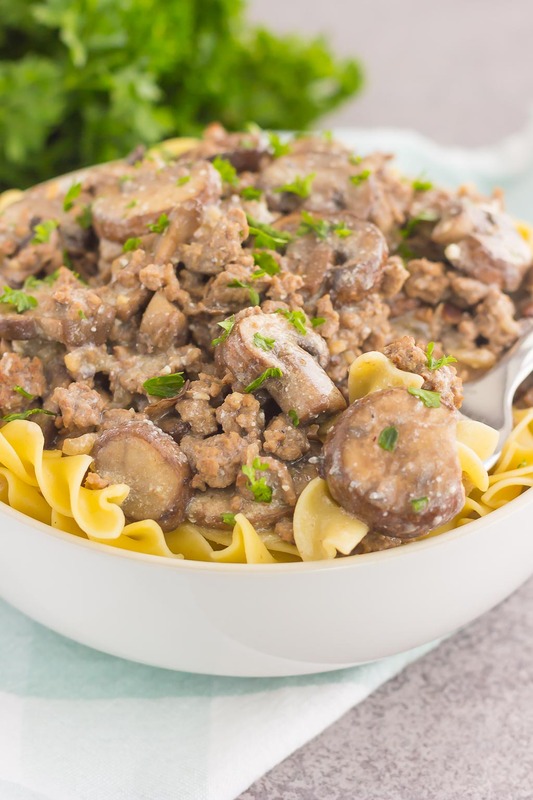 Unlike most other stroganoff recipes, this One Pan Beef Stroganoff is made without the canned, cream of mushroom soup. The combination of beef broth and a touch of sour cream and garlic make this creamy sauce extra special. And those mushrooms. Let’s not forget about the mushrooms! I used a pound of mini baby bella mushrooms, but if you’re not too crazy about them, feel free to only use 8 ounces of mushrooms. I also opted for ground beed, instead of beef chunks, just for ease of making the recipe. And did I mention that this is a one pan meal? Everything gets made in one pan, and one pan only. Which means less cleanup and a happier kitchen! 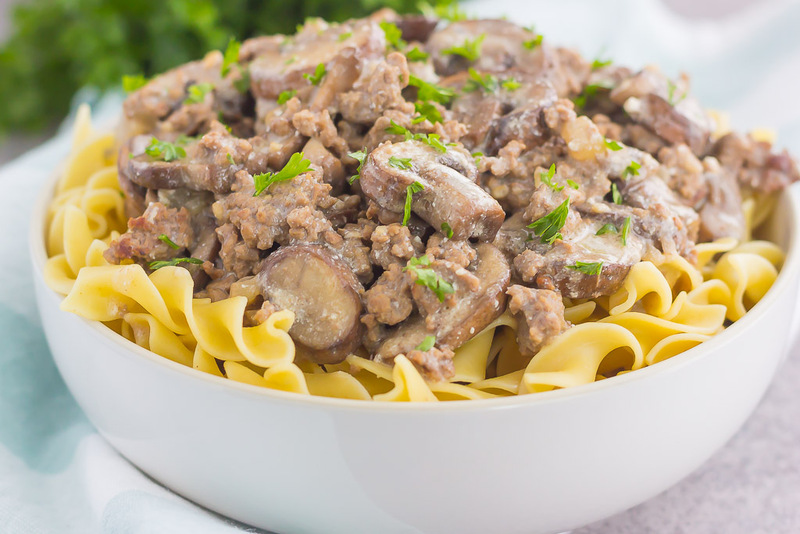 So relive your childhood or make your adult food dreams come true with this simple, One Pan Beef Stroganoff. Ready in just 30 minutes and filled with simple ingredients, it’s guaranteed to be a hit with even the pickiest of eaters! 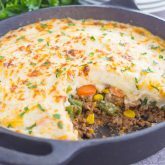 In a large skillet, brown and crumble the ground beef, onion, and garlic over medium heat until just a little pink remains. Drain, if needed, and return to skillet. Add mushrooms, salt, and pepper. 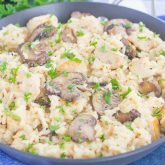 Cook 4-5 minutes, or until mushrooms start to soften. In a small bowl, combine beef broth, Worcestershire sauce, and paprika. Whisk in flour until no lumps remain. Add broth mixture to beef mixture and stir. Bring to a boil, then cover and simmer on low heat for 5-7 minutes, or until slightly thickened. Serve over hot egg noodles and garnish with parsley, if desired. I feel like we have the same childhood comfort foods! 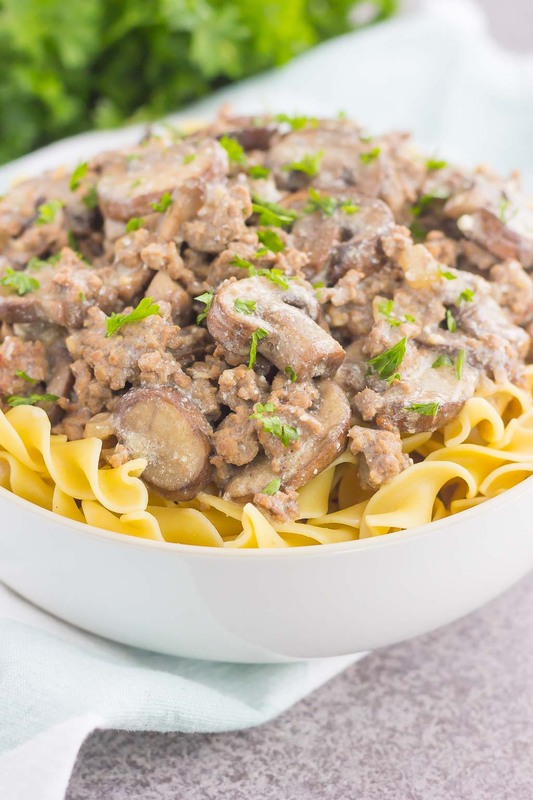 Beef Stroganoff was definitely one of my favorites, and your 30-minute, one pan version sounds amazing. Perfect weeknight dinner! Isn't it the best? Thanks, Blair! Beef stroganoff was something my father made A LOT when I was growing up, but truth be told, I haven't had it in ages! And I have ZERO clue why, because it's definitely comfort food at it's finest! Obviously NEED to make this! It looks just delicious and you really can't beat a 30 minute meal! Pinned! Cheers! It is great comfort food! Thanks, Cheyanne! You know what? I love beef stroganoff, but it's not something that was regularly made at home either! Love that it's 30 minutes and one pot, but you know what I love even more? That you didn't use canned mushroom soup! Love that you gave it creaminess from sour cream! Yay for team mushrooms ;) Pinned! Cheers to a wonderful weekend, Gayle! Yes! It's definitely so good without the canned soup. Thanks for the sweet comment, friend! Yep! Right back to childhood! This and Swiss Steak - these are classic dishes! This looks amazing! 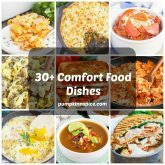 This is such an amazing 30 minute meal and I love that you made it all in one pot -- even better! I haven't made beef stroganoff in forever and this is making me hungry! One pot meals are the best! Thanks, Mira!